And some of the best people in town. Now I know what the dirty foreigners feel like. What is this, Russia? We don’t have to listen to talk like that. You’ve only got to hint whatever’s fit to print; If something’s wrong with it, why then we’ll print to fit. For whichever side will pay the best. The above vitriol is not from the president’s Twitter account, Fox News or sticky bitter corners of the Internet and AM radio. They were written in 1937 by Marc Blitzstein for The Cradle Will Rock. His 90-minutes of persuasive theatre in protest as musical wearing a big red heart on its rolled-up sleeves – is best remembered for its Opening Night. Sponsor The Works Progress Administration along with Actors Equity got nervous and shut the show down. Blitzstein, director Orson Welles, the Mercury Theatre players and audience responded by finding an empty theatre and performing it anyway. It’s a great story. Cradle is also a great musical whose messages still resonate. Classic Stage Company and their Artistic Director John Doyle take up Blitzstein’s call to arms in a terrific revival of The Cradle Will Rock , now at CSC through May 19. The Great Depression hit Steeltown, USA hard. One night Larry Foreman (Tony Yazbeck) calls a meeting for unionization of plant workers. Owner/robber baron Mister Mister (David Garrison) uses both his fortune and the self-recruited anti-labor, anti-immigrant Liberty Committee to denounce them. His harassment campaign extends to hiring hit men, bribing the police and coercing the press. Blitzstein builds the mounting tensions with flashbacks showing scare tactics directed at Harry Druggist (Yazbeck) who loses everything, Editor Daily (Ken Barnett) who loses his integrity and Dr. Specialist (Eddie Cooper) who falsifies an accident report in front of the victim’s sister Ella (Rema Webb). Additionally over the course of this night a Moll (Lara Pulver) is incarcerated for the crime of hunger. Dark comic relief is provided by Mrs. Mister (Sally Ann Triplett) and her children Sister Mister (Kara Mikula) and Junior Mister (Eddie Cooper). The brother/sister act stopped the show celebrating Junior’s new job as a reporter assigned to Hawaii. Blitzstein not only plays with time but music. Steeltowners sing opera, the blues, jazz and show tunes. His ideas and sound work convincingly well together. One reason why it is the influence of Kurt Weill and Bertolt Brecht. Even so, The Cradle Will Rock is an original. John Doyle avoids the excess messaging that marred The Resistible Rise of Arturo Ui earlier this season. The terrific cast of multitasksers are dressed in denim and overalls. Industrial waste barrels lining the stage are set pieces (a cross, ice cream fountain, a Beto-type platform for speeches) and crashed together indicating violent acts. 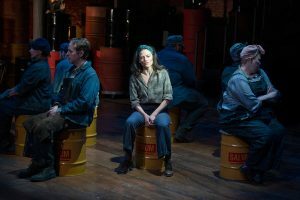 The director’s signature actor-singer as musician fits this show perfectly with Ken Barnett, Benjamin Eakeley, Ian Lowe and Kara Mikula rotating at the piano. The other key visual are the telephone wires hanging above the Lynn F. Angelson Theater. In revolution, those who rule the airwaves rule all.